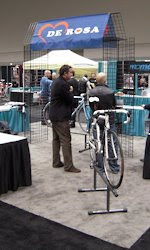 INDIANAPOLIS – 115 exhibitors and 6,428 attendees attended a highly successful fifth annual North American Handmade Bicycle Show, at the Indiana Convention Center, Indianapolis, February 27 – March 1, 2009, and many exhibitors called this the best show to date. 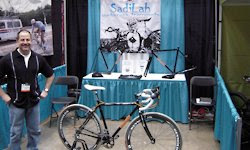 “I am delighted with the way NAHBS went this year. When I first announced Indianapolis as the location, a lot of people were unhappy about it. But I have always been confident there is a good market here in the Midwest for handmade bicycles, it’s just under-served. I think 6,428 people proved my hunch was good,” said the show’s founder and director, Don Walker. Media attendance at the show was approximately 100, the same number as at Portland in 2008, and the overall attendance figure is almost 1,000 less, but still well above the San Jose figure of 4,000 in 2007. 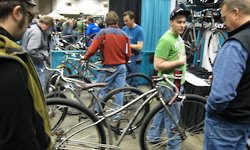 The growth trend for NAHBS continues despite the economic woes. 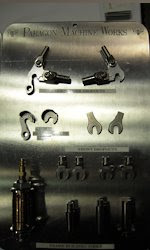 With literally hundreds of customers among the builders of lugged bicycles, Mark Norstad of Paragon Machine Works, who supplies a range of hardware accessories to the industry, has a fair overview of industry trends. “Business for me has been down a little on 2008, but 2008 was a record year. A lot of orders were taken after last year’s show. Many people who made those orders may not be willing to jeopardize their deposit even if they’re in financial difficulty now. We’ll know a lot more a year from now. I’m not seeing any frame builders quitting to get a day job,” said Norstad. Another thing Norstad said, which was echoed by other voices at the show, is there is an increase in the number of carbon fiber handmade frames being made. One example of this is Independent Fabrication, who won the Best Carbon Fiber Bicycle award for their prototype. Drew Guldalian, of Engin Cycles, pointed to other standards being taken up in the industry. One of these is the spread of the BB30 bottom bracket – one of the benefits of which is it enables use of the outstanding Zipp Vumaquad crankset. Another product Guldalian mentioned is the new internal head tube from Chris King. Some 15 builders received these before the show. One of these builders was Carl Strong, who incorporated it into his Best TIG Welded award-winning bike of 2009. Strong reported that this oversize tube gave a lot more surface area to attach other tubes to, as well as having a lower stack height which, in his view, improved the aesthetic. Many of the builders ended the show feeling very good about the whole experience. Below is a digest of their remarks – in random order. Richard Sachs – Richard Sachs Cycles: “I never thought the Midwest had to vindicate itself. There was criticism of the weather and travel concerns, which I thought was misplaced. The weather was good, but it really wasn’t a factor, and the number of people who traveled here from afar shows that travel was not an issue. “I would willingly come back here next year. “There was no downside to any aspect of the show. This was a perfect place. It was better, overwhelmingly better, on every level than anywhere we’ve been yet. The venue, the city, the hotel was a really great price for what you got, from the moment we got off the Interstate I got a good feeling about this city. It’s like a gift. Rick Hunter – Hunter Cycles : “It went really well. I’m very pleased with the attendance and the venue. 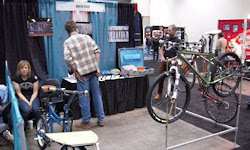 About NAHBS : The North American Handmade Bicycle Show moves from city to city each year and is usually scheduled close to the last week of February. The show is dedicated to showcasing the talents of established builders of custom bicycles. It aims to be a meeting point – online and in person – for frame builders and consumers looking for custom-made bikes, for the sharing of ideas, and the promotion of a special industry with a rich history. 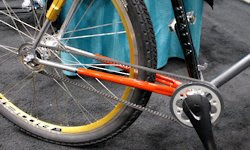 Since its first year in 2005, NAHBS has grown from a show with 23 exhibitors and 200 attendees to a show with 150 exhibitors and 7,000 attendees. 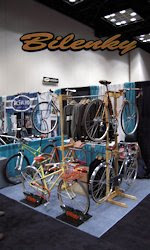 Three diverse booths represented the first handmade forays from Japan to NAHBS. Yohei’s blog! Yohei Morita is a photographer representing the Japanese side of COG, a large-format fixed gear magazine published in the US by Peter DiAntoni of Milwaukee and distributed in Japan by Morito. COG translates portions of both paper and web editions into Japanese. 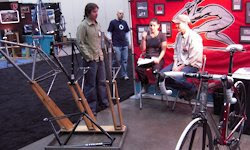 The magazine conducted a studio photo project throughout the 5th NAHBS. Morita has flown from Japan to attend all five NAHBS shows—and is a ubiquitously sociable photographer and reporter. Cherubim won “Best Track Bicycle” honors. Shin-Ichi Konno is a second-generation builder who also included in his display a road bike with unique stainless steel “mono aero bar” along with a red mini-velo. Kimori showed their line of Colossus truss-frame bikes, emphasizing full-suspension built around 20-inch wheels, plus adapters and converters for track, fixed and SS bikes. CCP hosted a large staff for their line of progressive fashion apparel. The owner commissioned three vintage-styled bikes to be built for the show by Ikeda of Rew10Works, who was also in attendance. In translated interviews, each of the Japanese companies said they thought the trip was well worth their while, adding that their wares were directly available to the US market via the web. 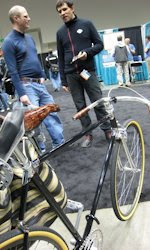 They each also mentioned that NAHBS was clearly on the forefront of global independent bike culture. Additionally, Italian builder Zullo brought along Japanese apprentice Masateru Yasuda as part of their show staff. Japan had a presence beyond the booths. 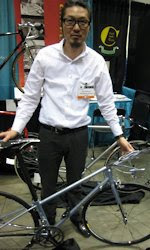 Recently retired top-ranked pro keirin racer Koh Annoura, now of Houston, Texas, attended show seminars with a view to learning frame-building and launching his own line of bikes. Japanese media was also on the scene. Videographer Teisuke Morimoto represented the new Japanese fixed gear magazine, Pedal Speed. Takehiro Kikuchi was a freelance writer for the mainstream magazine Cycle Sport, Japan’s version of Bicycling. 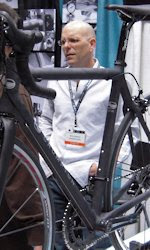 Nick Crumpton arrived at this year’s NAHBS as one of The Original Six, the cohort of framebuilders who have been represented at every show since its inception. What keeps him coming back? Well, the allure of seeing old friends and colleagues, but most of all an over-riding enthusiasm and joy at being immersed in a life-long love of cycling. Nick’s first interest in what makes a bicycle frame tick was sparked over twenty years ago when stripping a Schwinn Paramount back to the metal before his first paint job. The revelation of the intricacies of the brazes and lugs fascinated him and led him to suppose that he could do better. It was in the mid-nineties that he founded Crumpton Bicycles in Austin, Texas. 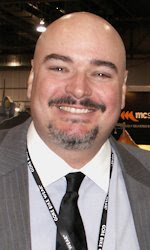 Originally building steel frames, Nick’s search for the perfect material resulted in the development of carbon fiber frames and their associated construction techniques. Nick wielded his brazing torch for the last time over two years ago. Asked what distinguishes his frames from any other carbon fiber bike builder, he modestly points out that every builder represented at the NAHBS produces great work, but if he were to characterize his own endeavors he would say that it is his passion for the sport and desire to produce the very best bicycle in terms of performance and comfort for his customers. At the moment, Credit Crunch America seems to be avoiding builders like Crumpton’s and their peers. Nick puts this down to the fact that builders like him have the support of a demographic which still rates quality design and workmanship very highly. This means that Crumpton’s bicycles are still built in America with the international kudos which that promotes and has contributed to Nick now having a European distributor in London, UK. So, Nick Crumpton’s “selfish enjoyment of riding a bike,” has resulted in the development of one of the most respected businesses in cycling run by one of framebuilding’s most respected personalities. 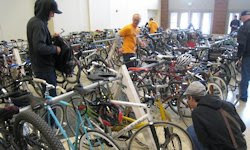 The “Pedal Park” at NAHBS offered valet parking to show-attendees who biked to the event. Jam-packed racks of hundreds of bikes gave an overview of the kinds of bikes that show enthusiasts ride daily. … And what an assortment it was! Patinas of scratches, stickers and mud couldn’t hide the handmade bikes that could be seen throughout the racks, revealing a wide range of set-ups for daily riding. It was a show alongside the Show! Courteous attendants kept the curious at bay, but it was enjoyable seeing obvious evidence that the kind of work showcased inside was being used outside on the rugged streets of Indianapolis. Broakland’s Twin Drive Bike: The whole point of Broakland Bicycle’s twin drive bike is simple: riding it is fun. The Oakland builders of three years created the bike’s unique crankset as a challenge to themselves and to add an aesthetic component to their riding. With creative input from a group of Bay Area graffiti artists and a breadth of fifteen years welding experience, these builders work to create something unexpected and exhilarating. In addition to being eye catching, the second chain provides a back up in case riding strapless and fixed snaps one. Two previous NAHBS showings find the guys from Brookline here in Indianapolis to connect with the rest of the hand-built community and visit with old friends. 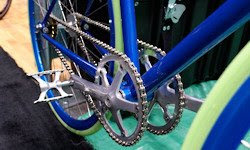 Renova’s Belt-Driven Crank set: The Italians at Renova have an interesting entry for their first showing in the United States. Their city ride-ready custom model comes equipped with numerous personal touches, but the stand out has to be the belt-driven crank set. The idea stemmed from wanting an older style of frame to be updated and different than most bikes on the road. Renova decided one way to accomplish this would be to alter the crank set, have a smaller chain ring attached to the bottom bracket, and switch out standard brake levers for ones from a motorbike. All this creates a quieter and more comfortable riding experience, and eliminates the need to roll up the right leg of your pants. The Waterford Joust: Innovations in Bike Polo The Schwinn family has a dedicated history of hand-building all ranges of steel bicycle frames full of heart. Based in Waterford, Wisconsin, they have been a part of the Schwinn Paramount factory since the 1970’s and eventually went on to found Waterford Precision Cycles in 1993. 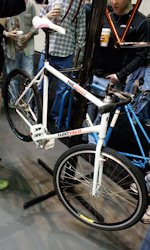 Although well known for their reputation within custom road frame circles, their newest bike polo frame, The Joust, has been drawing a sizable crowd to their booth at this year’s NAHBS. Anna Schwinn commented further on the detailed advancements made on the newest Joust model. “We wanted a 700cc bike with 26in. wheels, but that doesn’t leave any pedal clearance,” she said. 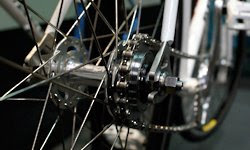 To adjust for that, the Joust’s bottom bracket has been brought up to form a nearly horizontal line with a smaller rear triangle, in addition to a longer, reinforced head tube connection to the down tube. A bash guard has also been implemented onto the crank set to keep players moving during the tough beatings the frame and components endure during a typical match. Okay … the party’s over … but the blog goes on! The images from the show have been pulled together here. Thanks to all contributors. Keep looking back because these are constantly being added to.